Ban Ki-moon’s tenure as United Nations Secretary General concludes this year and there has been plenty of speculation as to who will replace him. According to the rules, it will ostensibly be Eastern Europe’s turn. There is also hope that a woman will take the job for the first time. However if a suitable candidate from Eastern Europe isn’t found the field will be thrown open. Who will be there? Possibly, two of the Antipodes best remembered leaders, Kevin Rudd and Helen Clark (no relation to your correspondent). Both have led their countries, albeit Clark with greater success and for a longer time. That she now heads the UN Development Programme and has a good grasp of the UN’s labyrinthine bureaucracy and procedure possibly helps. According to many, part of Rudd’s undoing was his poor ability with details and bureaucracy, or dealing with staff. He was instead a man of big ideas, inspiring speeches, and public popularity. Rudd would likely give rousing speeches to the General Assembly. But how well would he deal with red tape that stretched across an entire planet, crisscrossed into hundreds or even thousands of Gordian knots of varying size? 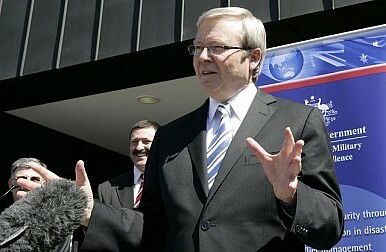 Rudd’s inability to cope with Canberra’s comparatively modest demands, coupled with abrasiveness, led to his famous “knifing” by his then deputy Julia Gillard. Kenny backs New Zealand’s Helen Clark, but would – were an Australian candidate necessary – plump for Kim Beazley (just back from a stint as Australian ambassador to the U.S.) or former Liberal leader Brendan Nelson. One supporter of a Kevin17 campaign is Foreign Minister Julie Bishop. Given the acrimony between her party and Rudd it may seem odd, but remember that it was under Rudd that Australia went for a non-permanent seat on the Security Council, something the Liberals when still in opposition lambasted for its uselessness and cost. However Bishop took to the role and not only did well but obviously enjoyed it. We covered her last speech in 2014, and she has already said she would like to pursue another spot at the Security Council when it comes up. Clark, who already holds down the third most senior job at the UN, has not made a public statement about the secretary-general position, but according to the New Zealand Herald it is “known” she would like the role. Former Australian Prime Minister Tony Abbott had earlier backed Clark but apparently without consulting Julie Bishop. A formal tilt by Rudd may mean Australia would have to back him; candidates must have the backing of their nations. John Key has offered full support to Clark but despite Bishop’s stance nothing official has yet been offered to Rudd.